Let's talk about two desserts I love, cheesecake and baklava. They're both sweet, rich and satisfying in the most comforting way. I love them both a lot, but not usually together. But a friend suggested I put them together in the form of a cheesecake baklava, or a baklava cheesecake if you prefer. At first I loved the idea. Then I began to think that I couldn't do it without creating something so rich that I wouldn't enjoy eating it. This took some time and thought. It's not an original idea in that I've seen bakeries with traditional looking cheesecakes and a layer of baklava on top. And, honestly, I kind of felt it was too much. It would be like just ordering both desserts but I wanted to really incorporate the two. 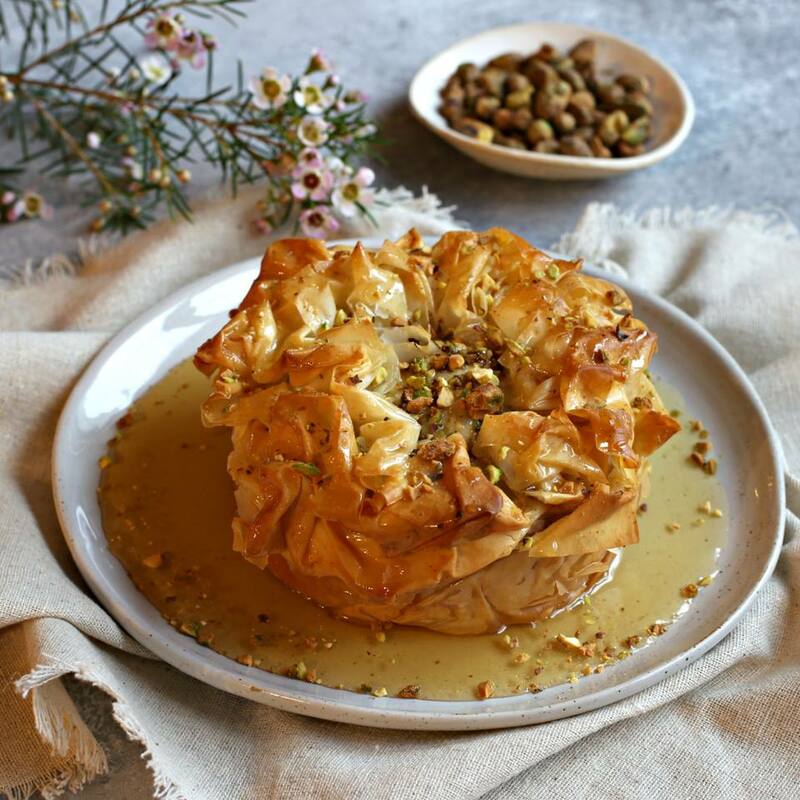 Since the main ingredients of baklava are phyllo dough, nuts and the syrup, I looked for ways to incorporate them individually. The phyllo dough makes a wonderful crust and I've used it that way before for other pastries, both sweet and savory. The nuts, pistachio are my favorite for baklava, can easily go on top of the cheesecake batter. As for the syrup, the phyllo is unsweetened and definitely needs it. But I kept the cheesecake batter a little less sweet and gave it plenty of acid from the lemon juice to allow for the extra sweetness in the honey syrup. Final verdict? Yes, yes and more yes! Enjoy. Make the cheesecake filling by combining the cream cheese with the sugar, egg lemon juice, sour cream (or Greek yogurt), flour and salt until fully mixed. Spread a layer of phyllo dough over each pan and brush with the melted butter. Add 8 more sheets to each pan, with melted butter brushed over each sheet. Allow the dough sheets to overhang the pan. Pour the cheesecake filling equally into each pan and sprinkle on the chopped pistachios. Fold the edges of the phyllo dough over the cheesecake. Don't worry about making it perfect. It will crumple up naturally. Brush on a little more melted butter and place on a baking sheet. Bake in the oven for 20 minutes, then cover the browned phyllo crust loosely with aluminum foil and continue baking for an additional 20 minutes. Make the syrup by adding the sugar, water, honey and lemon juice to a pot and simmering gently until the sugar dissolves. When the cheesecakes are done, remove from the oven and let cool just until you can remove them from the spring-form. Pour the honey syrup over each one and let sit for a few minutes to let it soak in. Note that I made this in two 4" round mini spring-form pans but you can also make it in a single 8" pan.